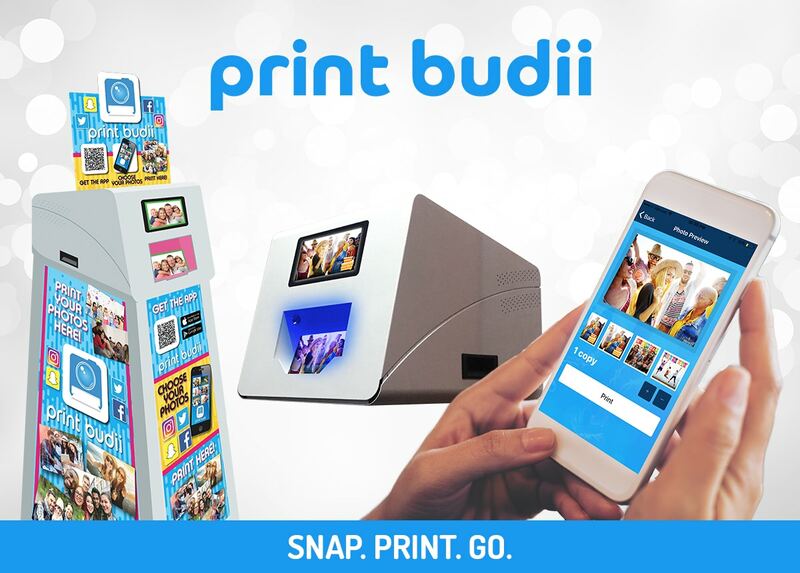 Greenvale, NY, November 2018 – “PRINT BUDII” is the name of the new Apple Industries’ division dedicated to digital photo printing via self-service kiosks in addition to the renowned photobooth company division called FACE PLACE. Apple’s FACE PLACE division is dedicated to the manufacturing of photobooths in the United States and includes the following popular brand names: Face Place Deluxe, Face Place Sapphire, Face Place Royale, Face Place Photo2Go, Face Place Wedding Booth, Face Place Pix Place, Magazine Me, Face Place Deluxe. The first product from the new born Print Budii division will be revealed at the IAAPA show next week: The Print Budii Model A Kiosk with the dedicated free Print Budii app available to download from Google Play and iTunes store. The Print Budii Model A is the world’s first app-powered self-service printing kiosk. With the Print Budii App, your customers can select photos from their phone gallery or social media accounts to customize, transfer and instantly print them! No cash required, payment is made through our do-it-all free app! The kiosk is very easy to install and plugs into any standard outlet. Print Budii owners can add their own localized content including promotional and fun overlays. This option will help our partners to raise brand awareness on Social Media as customers can share their customized photo on Facebook, Instagram, Snapchat or Twitter! Find out more on www.printbudii.com and visit Apple’s booth #1600 at IAAPA to print your photos using Print Budii! Apple Industries have more surprises to come this year and will introduce new products at the IAAPA Attractions Expo 2018 in Orlando, November 13-16, 2018. This year, do not miss Apple exciting stand 1600! Apple Industries (www.faceplacephoto.com ; www.printbudii.com ) is the world leading photo booth manufacturer and has been a family-run business for more than 50-years. Apple Industries manufactures, markets and sells the award-winning line of Face Place digital photo booths. Apple Industries has been in the photo, vending, coin-operated machine and event planning industries for more than 30 years.